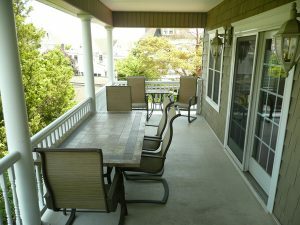 Make this 2nd and 3rd floor, 5-bedroom, 4-bath home your choice to enjoy a great vacation at the beach! Located on the north end of the island next to a public park, you will be able enjoy the incredible views from this location, as well as having room for “little ones” to play. 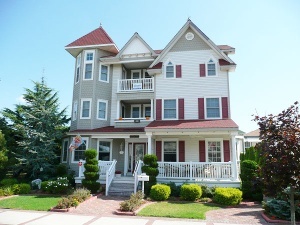 It is within walking distance to the beach, boardwalk and downtown. It is very close to the Ocean City Tabernacle and high school. It is a short drive to Atlantic City from the north end of the island. This luxurious unit offers parking for four cars, has an elevator, and has two Junior Master Suites as well as a full Master Suite. Luxury abounds with the hardwood floors throughout and has been appointed with many nice furnishings. There is plenty of room for your guests and great space to entertain. The patio is almost a private oasis with the park and trees from next door and there is a bar area that is adjacent to the spacious kitchen. There is room to expand in the dining room, if you have company for dinner. Each bedroom has access to a deck – most of which are private to that bedroom only. There are TV’s in each bedroom and wireless internet access throughout as well as an intercom/stereo system. One bedroom functions as a spacious office, if you don’t need all the bedrooms. The kitchen features stainless steel appliances and offers enough room for several cooks or bartenders all at the same time. Granite countertops add to the beauty of the kitchen area. We hope that you will be our guests at this very special and unique home! Owned by a PA Licensed real estate broker.